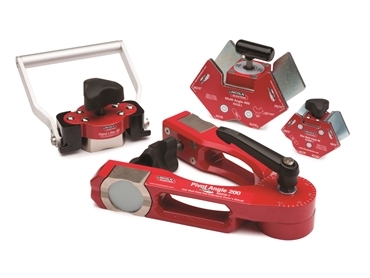 Lincoln Electric now offers a line of magnetic angle fixturing devices and hand lifters in its Radius tool welding gear product group. The magnetic fixturing tools can be used to position steel for tack welding or other pre- or post-weld operations. They also are suited for cutting and grinding applications. All are easy to operate—a half turn of the knob can toggle the magnet on and off for part removal and cleaning. The fixtures are compact and lightweight, making them perfect for tight spaces. In addition to magnetic fixtures, the company now offers a manual hand lifter designed for small steel part lifting and sheet dragging. The manual hand lifter does not require batteries or electricity.